The field of Prosthetics is particularly exciting due to the constant innovation of devices and techniques to improve the functional abilities of our patients. We work with our patients from post-op care through the lifetime evolution of the prosthesis to maximize the fit and function of the device. Cutting edge technology such as the C-Leg, Proprio Foot, and myoelectric controls allow us to most effectively mimic the function of the anatomical limb. Your practitioner will work with you to meet your ongoing prosthetic goals, including increasing your physical abilities and the cosmesis of your artificial limb. 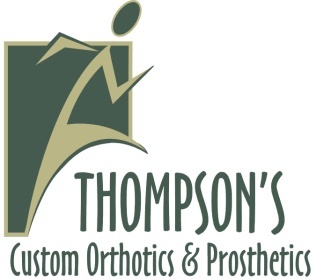 At Thompson’s we strive to provide only the finest prosthetic devices through use of the most advanced techniques and technology. No matter what the age or size of the amputee, we have the experience to make their transition to prosthetics a pleasent one. We also offer pre-amputation counseling and evaluations, as well as immediate post-surgical care and fittings. The fitting process varies slightly depending on whether the patient is a new amputee receiving their first prosthesis, or if they have been wearing a prosthesis for some time and will be receiving a replacement prosthesis. Our Team will work with you to make sure you fully understand each step of the prosthetic process and what each step means to your ongoing lifestyle.